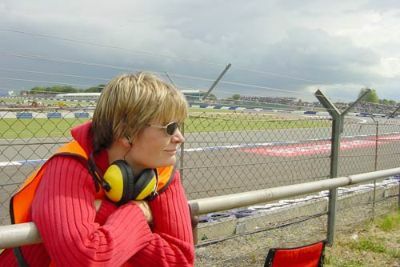 Last year we were lucky enough to go to the British GP with tickets given to us by Mark. 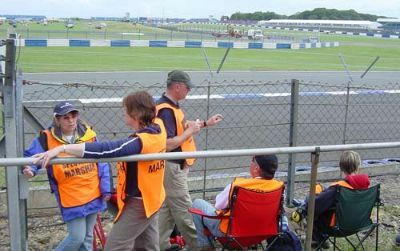 He gets a certain number of tickets as he has worked as a marshal for many years. 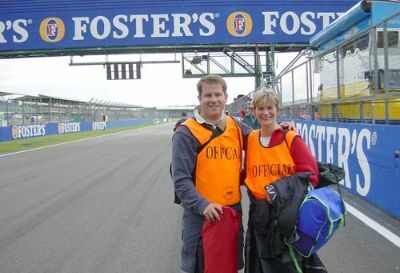 This year we agreed to work for our free trip and act as spectator marshals at the 2004 GP. 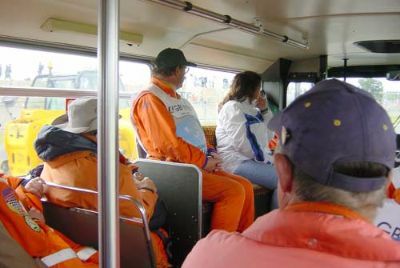 After 2003's incident where an idiot ran onto the track on the hanger straight, the organizers had arranged for many more marshals to help at the event. 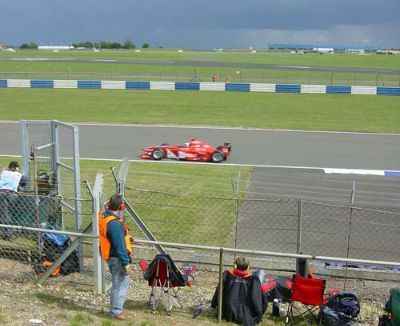 Every small gate through the debris fence had to have 2 marshals covering it. 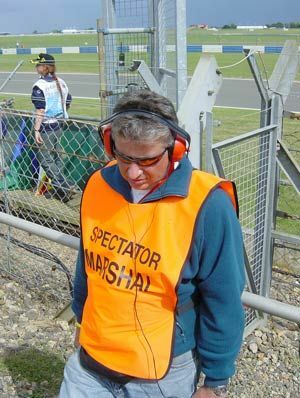 This had meant at least 80 extra marshals, which was why we were there with Mark. One of the 'perks' of the job! 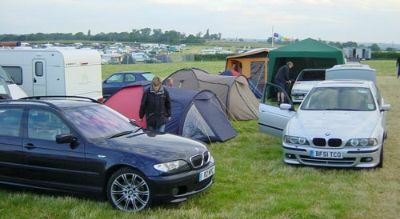 The marshals campsite is right outside the track. 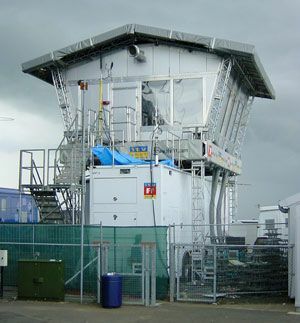 Decent facilities include a basic shop and lots of hot showers. We were due for work on Saturday and Sunday. An early start began with a briefing at 6.30am. The it was on the buses and out to our post by about 7am. With the last race of the day starting at 6.30pm it was to be a long long day! 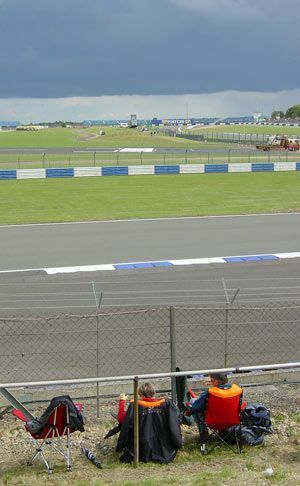 Our patch had quite a good view of the track. We could just about see up towards Vale and almost the exit of Stowe. Our job was to always man thegate, and generally keep control of the crowd. No one was allowed in front of the metal barrier, so we were based between this barrier and the debris fence. Our main job was to stop people ducking under the fence to take pictures. In the event of any incident we were to help control the crowd. 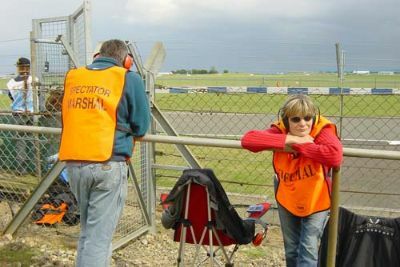 We had nothing to do with anything on the track, where fully trained track marshals operated. We happened to be right next to a flag marshals post. We were there to work. 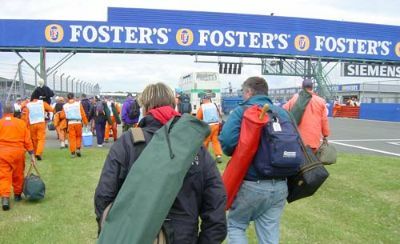 Of course it meant we got into the GP free, but the disadvantage was that we certainly could not walk around - we were tied to one location - and we were not permitted cameras whilst working in our privileged position - that is why there are no pictures of any F1 cars here! 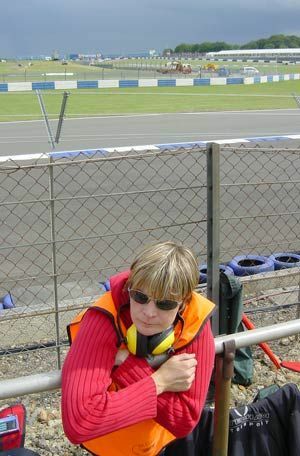 Tessa concentrating on the track action! Mark does the same! 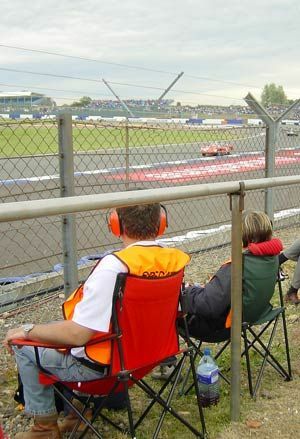 Earphones tuned into Silverstone radio kept us up to date with what was happening. Tessa still transfixed by the action. Oh no - must be mistaken. 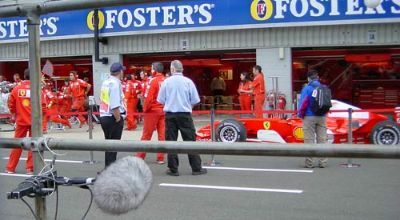 As you woud expect there was a lot of hanging around between track action. They need to do something about the amount of track time the F1 cars have on Saturday (and probably Friday) - and on Sunday the first time they are seen is just before they line up on the start grid at about 12.30pm. People get trackside when the gates open at about 6am - that is a long time to wait without even seeing a car. Blimey - a car! 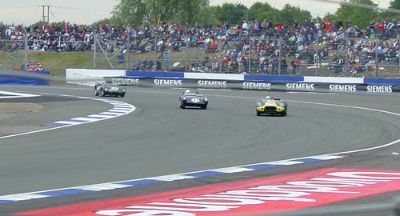 An F3000 car buzzes past. 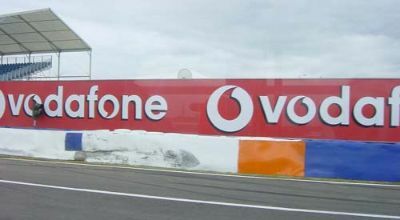 Support races included F3000, Porsche Cup and Vodaphone Maserati Challenge. 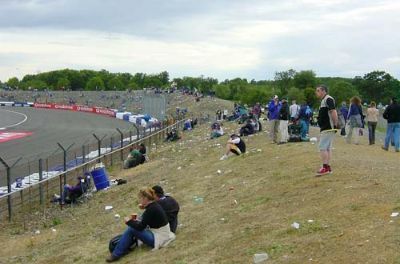 When ever the F1 cars were on track every patch of these banks was covered - particularly on race day. Moving through the crowd was very difficult - most people had set up camp with deckchairs and supplies. 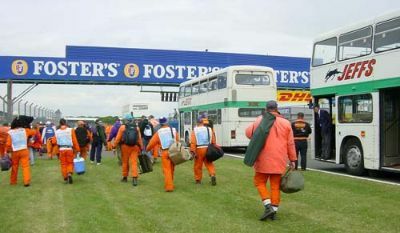 At the end of a very long day trackside all the marshals were picked up by a fleet of buses. 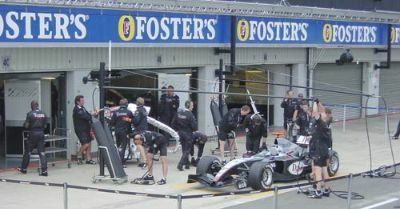 As we got back to the start/finish straight on Saturday evening we were able to watch a few of the teams practicing their pit stops. McLaren their usual efficient uniformed selves. 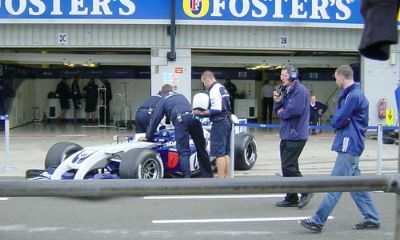 Williams packing away their tusk-nosed car after practicing tire changes. You can just see Frank, right hand garage. 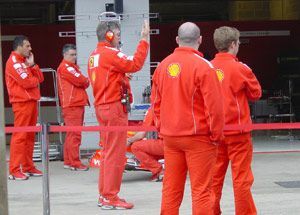 ...directed by Ross Brawn, stop watch in hand, they would run out as the car was pushed into position, do their stuff and then go back into the garage. Ross would wave the car forward again, and they would repeat the exercise. Everynow and again Ross would through a random event into the exercise. You could just tell they were prepared for anything. 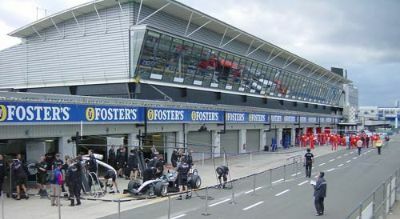 Car comes in - notice the mechanics running to there positions. 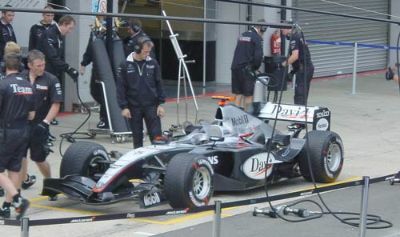 As well as changing the wheels and re-fueling we also saw them changing a nose cone. 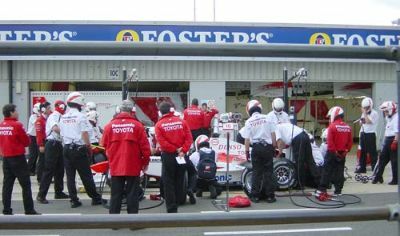 Right down the other end of the pit lane Toyota were doing almost the same. Somehow they just didn't look as slick, but for all we knew it could have been a bunch of corporate guests playing?! Adil posing around about grid number 7 or 8 on Saturday evening. 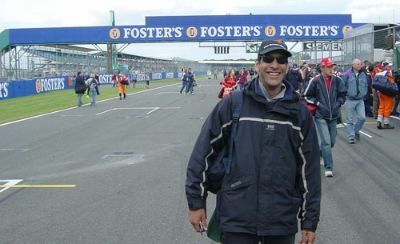 Adil and Peter C were looking after a section just down from us near the apex of Club corner. 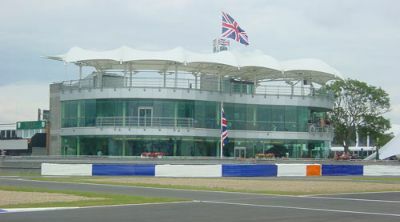 The ITV mobile studio, just outside the track on the start/finish straight. Peter C in the camp. 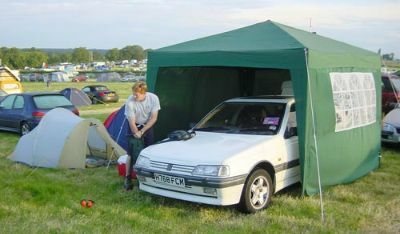 Note how he has the little tent to the left - his car has its own garage!! Of course the gazebo was actually shelter for the inevitable rainy bar-b-q! Race day and the crowds were much larger then Friday or Saturday. 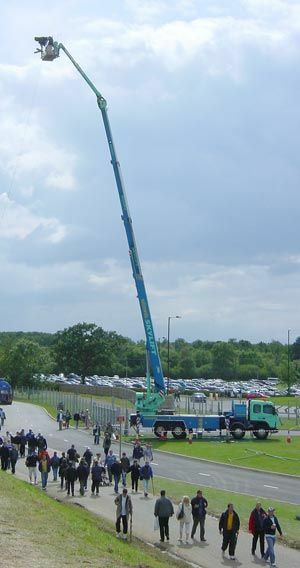 Brave camera man about to be hoisted even higher for those aerial shots. Notice how we are all paying great attention to the track again! 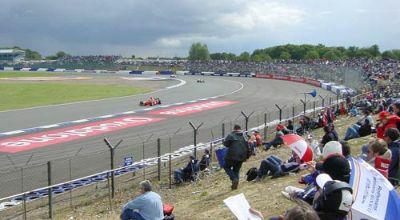 Good example of how even at older tracks like Silverstone the track can be a long way from the spectators. ...many people left right after the F1 race finished so this was a bit more relaxing for us! Some more glorious 4-wheel drifts. Back on the bus at the end of a really tiring weekend. I think this is where Trulli hit the wall in his Renault after coming under Bridge. Our convoy tackles Woodcote and passes the pitlane entrance. Tessa and Mark trudging back loaded down with chairs and remains of the days supplies.